Holly Hill Homestead B&B / Parkers Crossing Cabin, a charming farmhouse surrounded with herb and perennial gardens, offers 1920s-style tranquility. Located in Hughes Springs, the host and hostess are well known for hospitality, offering both privacy and personal attention. Most days there are wonderful aromas of fresh baked herb bread, pies and pastries from the big country kitchen. The farmhouse is adorned with treasured antiques, each having its own story. Furnishings are to sit on and the house to be enjoyed. 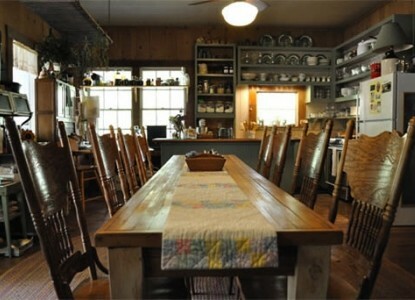 As one guest said, "A wonderful place to rest my body, feed my soul and sample good cooking." Located 3 hours from Dallas, 1 hour from Shreveport and 1 hour from Texarkana. Holly Hill's kitchen is known for its variety of foods prepared with fresh ingredients ("from scratch" as they say). Fresh, melt in your mouth herb bread and homemade pie. 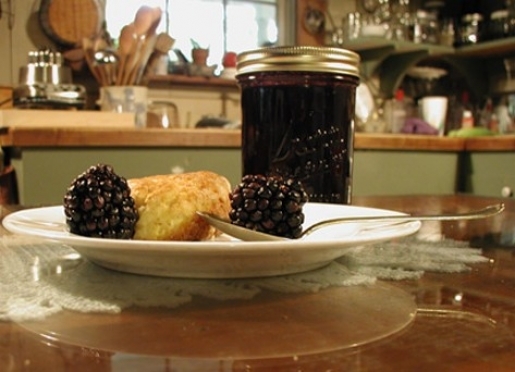 Enjoy a delicious B&B Country Breakfast each morning. You'll love the relaxed dining in the country kitchen or private dining on the screen porch, sun porch or out doors weather permitting. Picnic basket meals available. Travelers are always looking for memorable and relaxing experiences. Let’s discover more through the words of our innkeepers. Many thanks to Tim & Jolene Wilson for sharing their own secrets with BBOnline.com! People come here to get away from the busyness of fast paced life and feel like they are going to Grandmothers. The extensive gardens have been visited by folks from around the world. Holly Hill is best known for the food we serve, cooked from scratch. Our inn is unique because we strive to make people feel like they are family here on the farm. We love our farm house filled with turn-of-the-century antiques. A peaceful feeling overwhelms you when you start up the drive. Legend has it, “There is a strong box of gold buried somewhere in these here hills.” You can Google – Trammels Trace Treasure. Look for the gold! Visit our area lakes, state park, great local wineries, and enjoy amazing food and shopping. There are wonderful small town museums, Music City Texas Theatre, and historic Jefferson TX. 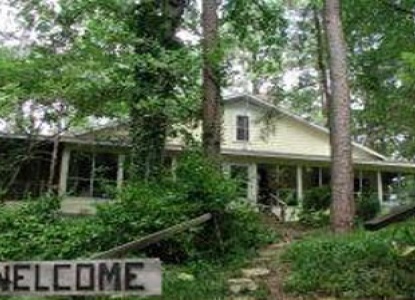 Our rural B&B is located 4 miles east of town in the beautiful Piney Woods of Northeast Texas. Nature trails for hiking and birding attract many guests. Within 15 minutes in Avinger TX is “Five D Steak House”, worth the wait if you don’t have reservations. 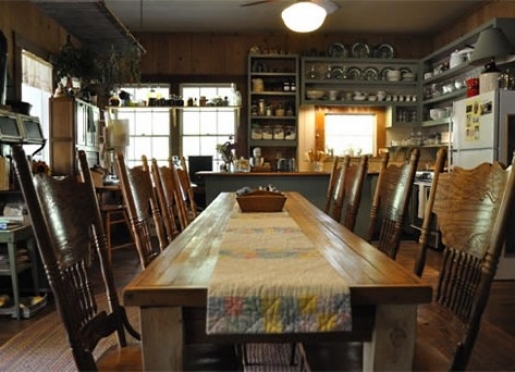 Our property offers two private rooms and a cabin that sleeps four. We do not accept pets. There is pet boarding at our local – Hughes Springs Vet Clinic. Holly Hill Homestead B&B / Parkers Crossing Cabin has been in operation since 2001. These 12 years have brought guests from most every state and many foreign countries. The home was originally built by a cotton farmer in the early 1920’s and rebuilt in 1978. A fifty ft. open porch welcomes guests to the front door and a glassed in sun porch offers natures view with butterfly and bird watching. The entire house has 10’ ceilings, a double fire place, wood cook stove, claw foot tubs, and pine flooring. Lovely antiques and collections are used daily which adds to the ambiance of visiting at Grandmothers. Accommodations in the old farm house are two queen rooms and private baths. A full sized bed adds extra sleeping space and is located on the enclosed sun porch. Tucked in an alcove by the kitchen fireplace is a cozy twin bed, favored by teens and children. 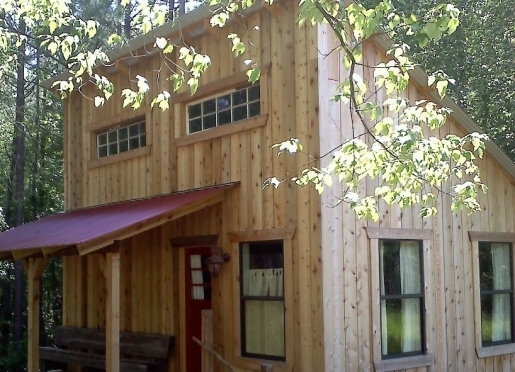 In the spring of 2012, Parkers Crossing Cabin was added to the property. This lofted cabin offers a private queen bedroom and a queen in the loft, barn tin ceiling and shower, aspen walls, native cedar staircase and crepe myrtle wood hand railing. Renowned herb and perennial gardens encircle the house and buildings atop Holly Hill. 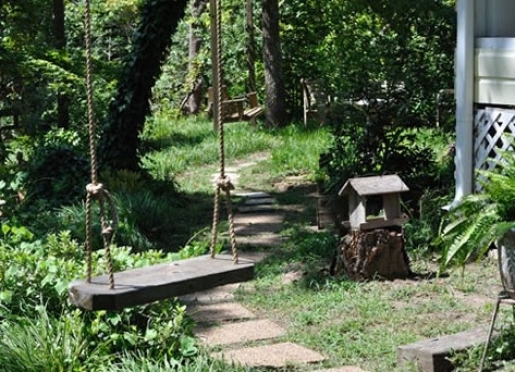 A garden walk takes guests to visit the resident chickens and farm animals. This B&B is located within the triangle of Dallas TX, Texarkana TX, and Shreveport LA, with easy access from I-20 and I-30. Learn more at hollyhillhomestead.com, Facebook, Trip Advisor, Google and “Atop Holly Hill” blog. Holly Hill Homestead B&B / Parkers Crossing Cabin we love to garden. You’ll find a wide variety of herbs, fruits, vegetables, flowers and trees. It is with great pleasure that we serve gourmet meals made with our own produce whenever possible. Take an educational garden tour, or wander the grounds and trails enjoying the wonderful gifts of nature by yourself. These gardens have attracted international visitors for over 30 years, including travelers from China, Africa, Australia and England. At one time over 400 species of native plants, herbs and perennials were identified on Holly Hill. Many of our garden plants are indigenous to the Piney Woods region but the collection of tropical plants is also fun and interesting. As a result of lush plant life, wildlife is in abundance. At any given time you may see many species of birds, butterflies and much more. Unfortunately much was lost during a tornado in the fall of 2009. Most of what was shade gardens is now transforming into lush and beautiful sun beds. The restored gardens will include a Spring Walk, Children’s Garden, Memorial Garden and a Red Autumn Walk. Follow our blog as we write about building back the beauty for which Holly Hill is known. We invite you to browse the index of Herbs and Other Plants. This is a “then and now” list of what grows at Holly Hill. Come relax and get lost in nature at Holly Hill Homestead Bed and Breakfast. We offer our guests a full breakfast and prefer discussing menu options with you. We like to take special note of likes, dislikes and dietary restrictions. Choosing from one of these categories will help us prepare a breakfast that is sure to please. Additional Meals by reservation only: Food from the Holly Hill kitchen is ‘from scratch’ as they say and we take pride in the use of seasonal fresh fruit, vegetables and herbs from our gardens, East Texas orchards and farmers markets. Most requested items are the Holly Hill Herb Bread and our Poppy Seed Dressing. Our prices do not include tax and gratuity. The entrance to Holly Hill Homestead is on the left with a white mailbox and white sign.